Monroe, NY - A Kiryas Joel resident is being praised for his honesty after returning over $2,000 in cash erroneously given to him by a bank teller yesterday. 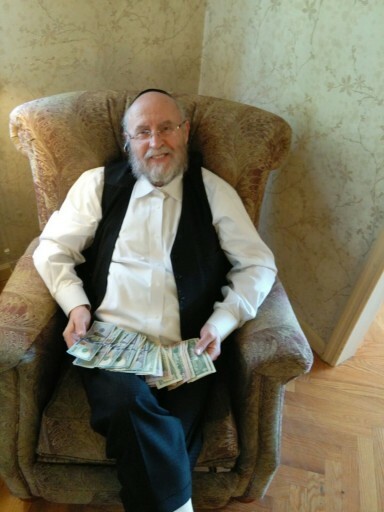 Joseph Waldman, owner of Simi’s of London in Kiryas Joel, had gone to the Sterling National Bank branch on Route 17 in Monroe on Wednesday morning to arrange a wire transfer. 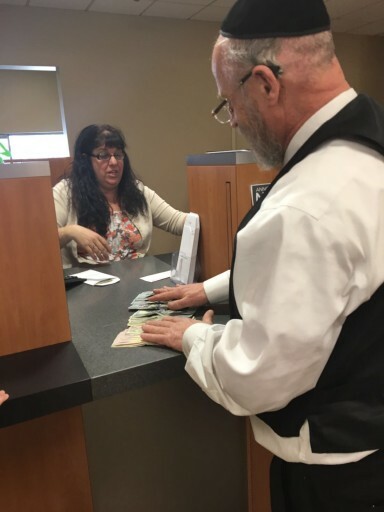 While bank manager Debra McCarron was putting the transfer through, Waldman took advantage of the opportunity to cash two small checks that he had received from customers. Because the checks had been drawn on the same bank, the teller did not ask Waldman for any identification in order to cash the checks. “I asked her to give me a few rolls of nickels and the rest in singles,” Waldman told VIN News, explaining that he needed change for his store. Waldman said that as the teller handed him the money, Ms. McCarron called him over to discuss the wire transfer. “I didn’t want the bank manager to wait so I thanked the teller and just put the money in my pocket and ran back to the manager,” said Waldman. It wasn’t until Waldman left the bank and took the money out of his pocket that he realized that the wad of bills he held in his hand was far more substantial than it should have been. Not knowing the name of the teller, Waldman called McCarron immediately from his store to advise her of the mistake. Waldman said that McCarron was busy with a customer when he called and when he hadn’t heard back from her an hour later, he called the bank again. McCarron, who was unaware of the mistake, told Waldman she would look into the matter, calling him back again a few minutes later saying that the teller had inadvertently cashed out the $25.00 check at $2,500. Waldman said that despite the fact that the bank hadn’t asked him for any kind of identification, it never occurred to him to keep the money. The teller, Fran Keeshen, said that she had only looked at the numerical amount on the check instead of also reading the words that spelled out the written amount. Mrs. Keeshen said that she was extremely grateful to Waldman for his honesty. at the end of the day when tellers fall short of their daily closing station the teller and manager don't go home till the shortage is accounted for,either my error or missing. The normal procedure is they review every transaction and pin point where the money went and then they look back on surveillance camera and they can see who they handed the extra money to. I am sure in this case they would of seen the teller handing out more bills then she was supposed to and they would of seen who got the extra money. I am trying to understand when someone gets $2500 instead of $25 dosent he see it on the spot.? you really stuff in all that cash in your pocket and only realize it on the way home.? something smells fishy with this story and I will leave it by that. He is a good Jew. We should all be inspired to do the right things in our own lives. “ at the end of the day when tellers fall short of their daily closing station the teller and manager don't go home till the shortage is accounted for,either my error or missing. The normal procedure is they review every transaction and pin point where the money went and then they look back on surveillance camera and they can see who they handed the extra money to. I am sure in this case they would of seen the teller handing out more bills then she was supposed to and they would of seen who got the extra money. Do you have somthing against Mr. Waldman? Give credit where credit is due!! Wow, Yoli, (#3), would it have bothered you so much to say "what a kiddush Hashem" people are always multi-tasking, on their cell phones.... no, he didnt "chap" right away and immediately called the bank to let them know....... Takeh, mi kiamcha Yisoroel! He should run for President of the United States! I made my way to his KJ store 2 years ago from Rockland because of the polite service Simi's of London offers (as opposed to some other stores in Monsey. Mind you since the competition grew, things changed), and now this article, i am not surprised.. Nice appreciative people. Good luck. #8, I don't know Waldman, but I will give him the benefit of the doubt and assume he has better things to do than waste his time fighting against Israel and Zionism. Yoli, One of the checks were for $25.00. Only ONE of them. Cant you read? Perhaps the other check was for $1000.00? Nothing smells fishy but your comment. There is no way they wouldn't have tracked him down eventually. Anyone with any experience with banks would know this. It's hard to say though if he did realize the money was 2500 because she may have given him 25 hundreds which he may have thought were 25 one dollar bills. Hard to know what he was thinking. In any event, the guy did return the money, whether he was scared or whether because he felt the moral obligation. For a change it reflects positively on Jewish people....that's something to be proud of big or small. This is a newspaper story? What's the big deal, that a Jew acted honestly? Seriously that merits press coverage and everyone patting themselves on the back? How low we have fallen! He got the extra money between a few rolls of coins. The teller put it all into one bag. He only saw it after he left. This is a great story. I am just not sure why he took all the videos and pictures? What a shanda. No idea why this is news or made a deal about it. A simple mistake and a Jew does the right thing. End of story. No need for it to be in the media. Taking pictures of all the additional cash; taking a video of the phone call to the bank?! Makes us all look like we'd all keep the cash but THIS is a rare exception. If u notice in her store in Monroe she has a $2000 check hanging on the wall apparently someone gave her a check from a closed account. She pointed it out to some customers as they wanted pay with a check for their merchandise. Most stores do not except checks anymore for a while. Nice people thank you for sharing the article. No snobbish there they serve customers nicely, unlike some kids stores in Monsey. What he did is a Kidosh Hashem, but if he wouldn't of return the money the bank would of cought it by the end of the day and Mr Waldman would of gotten arrested, and that would of been a Chillol Hashem. Read the article again fishy Yoli. It does state that he asked for singles, therefore he was expecting a nice wad of cash. That's what he does all the time promoting himself. “ Do you have somthing against Mr. Waldman? No the poster has nothing against you Mr Waldman! Its not even that he acted honestly he was just afraid getting caught. Why all this publicity? Did he return the money photographer in tow, or what? Alter, he must be a zolly and you are an aroiny or vice-versa. some people only look to say bad things. so sad. I for one think it was a Kiddush Hashem. stop trying to read between the lines to make it evil. I agree with you. It's hard to get away with so much money, with all the video. ok I do pull back my words. maybe he never realized all the extra money he got but I don't see the need to record someone without telling them they being recorded but of course this is yossel waldman style. About five years ago, in my community, there were thousands of dollars which somehow flew out of an armored car, while it was in transit. While some pedestrians and drivers scooped up some cash and ran, others were more honest and returned the money. One was a very frum Rabbi, who together with his children retrieved some money, and took it to the local police station. I'm sure that the cops were impressed, when they saw them coming in with the money, and returning it. I love these stories describing it as a revolutionary peledik event when it should be the norm. It's just showing that most people are thieves and liars if they can get away with it. I also agree that most people would know the difference between two small notes and at least 25 large notes. As you clearly see in his photos when he showed off the money, so he was supposed to get the same numbers of bills as he got! So before anyone makes a judgment, you have to think and find out the whole story, the entire store! And give Credit where Credit is Due.